Celtic cross plate is a small design that features an Irish blessing and is enhanced with knot-work. 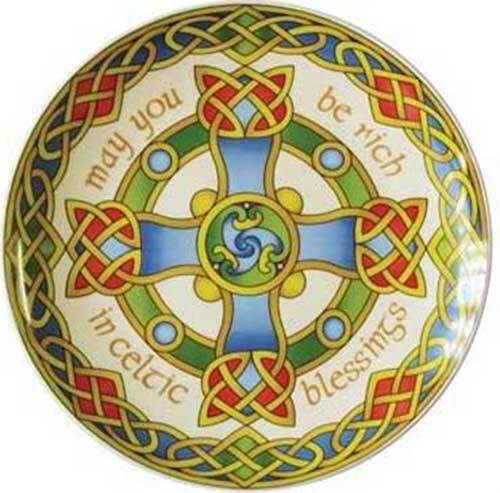 The verse on this Irish blessing plate reads: May you be rich in Celtic blessings. This bone china Celtic cross plate features knot-work along with an Irish blessing and measures 4" in diameter. This hand crafted Irish blessing plate is ready to hand or stand with the included easel. 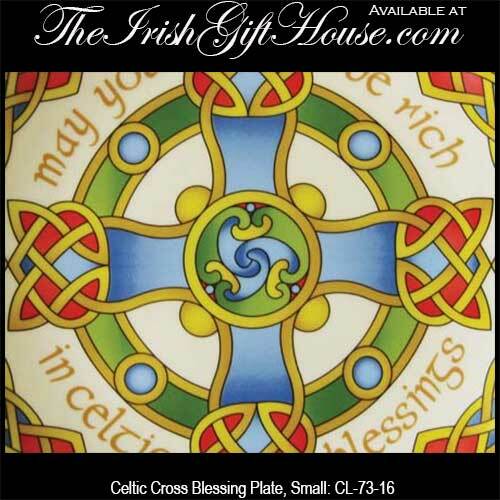 The small Irish blessing plate is gift boxed with Celtic cross and Celtic knot history cards, complements of The Irish Gift House; it is made in Ireland by Clara. This Irish blessing plate was inspired by 9th century ancient Celtic manuscripts which would have been painted by monks onto vellum or calf skin.